It works on all smart phones and tablets on the market, like ipad 1 2 3 4,ipad mini 1 2 3 4, iPad Pro,iPad air/iPad air 2, iPhone 7/7s Plus,iPhone 6/6s plus, iPhone 5s/5c/c; Samsung Galaxy S6/S7 Edge Plus, Samsung Galaxy Note 4 Note 5 etc. 2.Please make sure the screen protector is less than 0.3mm of good quality,or it may affect the writing.If you can't use it on your device, please remove the screen protector or change better quality screen protector, it works then. 3.Please note that the power will be off in 3 minutes to save energy if there is no operation. 6.If you have any questions in using the stylus, please feel free to email us directly, we will help to solve any quality problem. 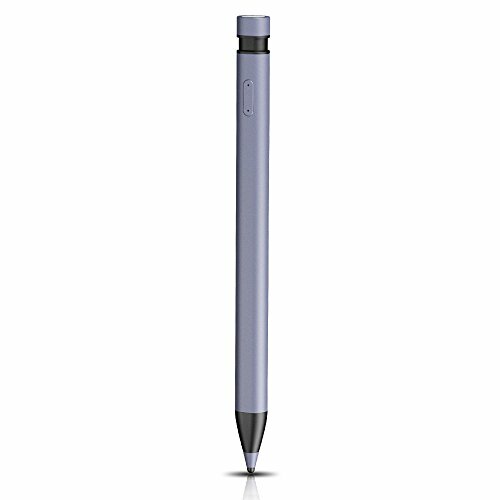 Works with most popular devices: Awinner active pen with the latest Tip-Sensitive- technology provides a more accuracy & adaptability for using on any smart phones or tablets to get a seamless pen on paper writing experience. App Worry Free: it works with almost all APPs, like Note Taking Apps, Drawing Apps, Handwriting Apps, Games, Adobe, Sketchbook pro, Procreate, Zoomnotes, Evernote, Paper by Fiftythree etc. Easy to Set up & Use: no pairing nor software needed, Rechargeable Internal Battery and it can work continuously up to 12 hours.